A South Sea pearl is an organic gemstone. Hence, it’s sometimes not as perfectly shaped as the manmade creations we are accustomed to seeing. Yes, when we think of pearls the ideal image in our minds is a perfect sphere, but that is rarely the case with authentic pearls offered for sale. 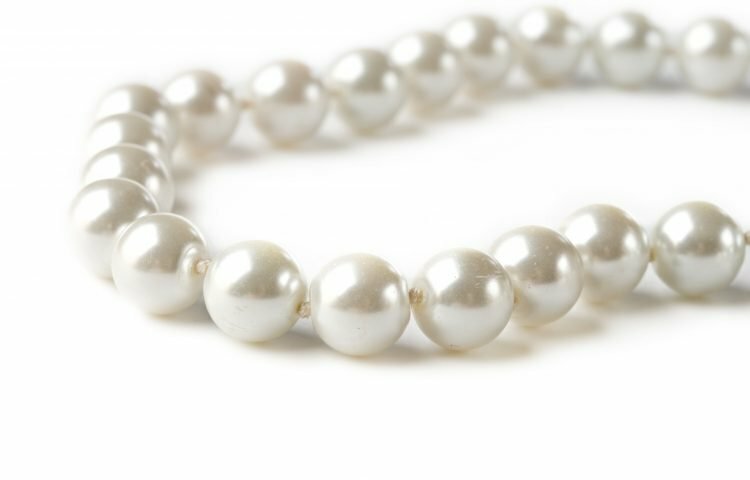 This can become confusing, especially when its shape is a significant grading category used for determining the value of each pearl. The South Sea pearls shape can vary greatly. Some abnormalities detract from a pearl’s value, while others have no impact on value at all. Determining which shapes are acceptable and which are not is a key component to assigning value and grade. The basis for all pearl shape grades is symmetry and roundness. Notice this does not mean perfectly round or absolutely symmetrical. A pearl is a naturally formed object. So, it’s expected that some irregularities will be present, even on the most expensive pearls. It can take the harvest of ten thousand oysters to create one sixteen-inch strand of round and symmetrical pearls under the current standards. Perfection in a South Sea Pearls shape is only one of seven categories used to grade the quality of these varieties of pearls. 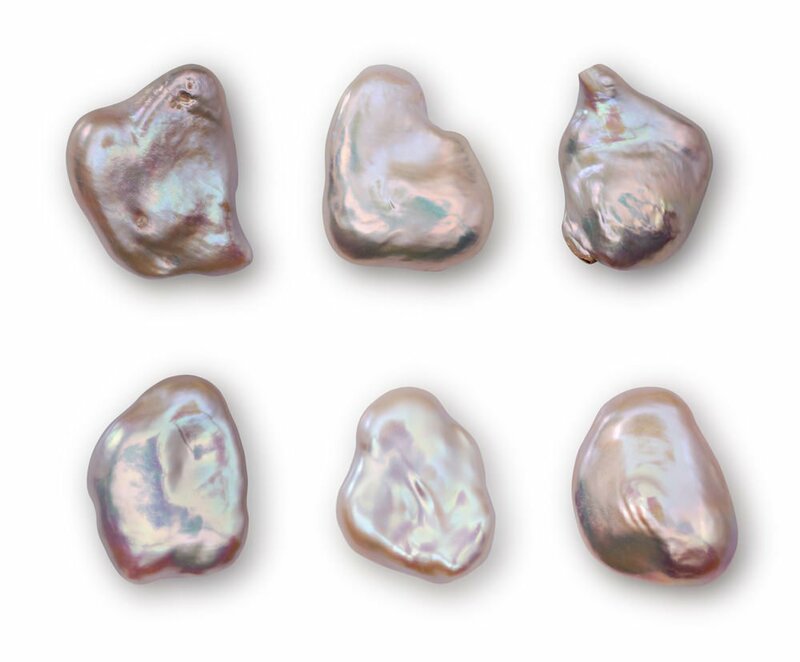 The entire list of seven categories describes every possible aspect of a pearl. For South Sea pearls the first five characteristics on this list are the most important to the grading process. Classic and Baroque are the two main labels for a South Sea Pearls shape. Classic refers to any pearl which is found to be symmetrical and round. Thus, all other shapes are called baroque. Pearls of every shape are still graded according to each applicable category. That’s because luster, color, size and pearl surface quality vary greatly between both classic and baroque pearls. 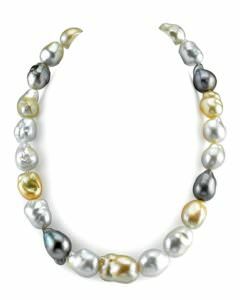 Just because a South Sea pearl is not perfectly round and symmetrical does not mean it cannot be used to create elegant pearl jewelry. But if you’re looking for a traditional strand of pearls, only the classic shape will suffice. However, beautiful strands can be created from semi-round and oval pearls, especially if they are matched closely in size and luster. Or, they can be arranged in a graduated fashion to promote visual interest in the necklace. Fully asymmetrical baroque pearls make beautiful centerpieces for rings and pendants, while the drop shape lends itself perfectly to stunning earrings. Baroque shapes definitely have their places in jewelry making, especially if the designer is creative and understands the natural beauty of the material. A large part of the allure of owning a South Sea pearl is the natural creation process. Organic gemstones are rare and beautiful, but not perfect. When shopping for South Sea pearls, expect small irregularities, if you want the real deal. Natural “flaws” are part of the charm… the art of what makes a pearl a pearl. And to the knowledgeable, small flaws are proof that the pearl is authentic and valuable.